21st wedding anniversary gifts are celebrated with brass, a metal that has been important for centuries with jewelry , coins and more practical nautical uses too. Brass jewelry has been found that dates back to 4000BC and has been associated with the goddess Venus/Aphrodite, the goddess of love. You couldn't get more appropriate than that! 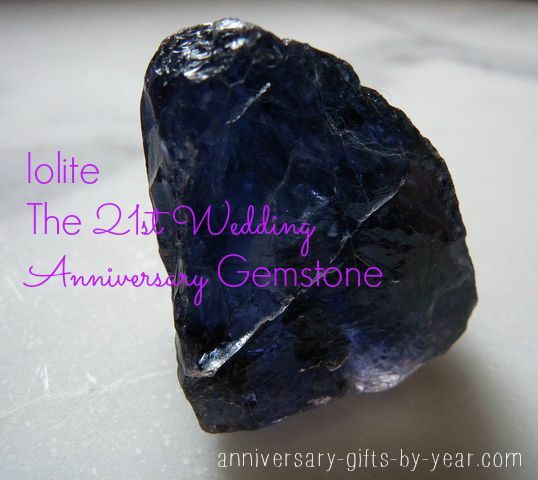 And on the Gemstone Anniversary List you celebrate your 21st with the purple gemstone Iolite. The meaning behind the symbol of Brass for your twenty one years together is that your love shines brightly and with all of the love and care you give to each other it is still beautiful. Iolite is your gemstone for this year and has strengths of joy and happiness. 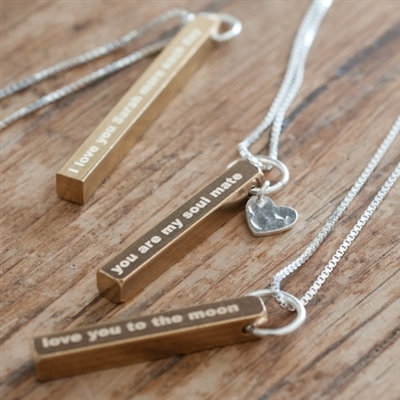 This stunning and Romantic Brass Bar necklace is engraved with your own message of love. Plus it comes with a Sterling Silver Heart pendant on a Silver chain. The perfect 21st Anniversary Gift for your Wife. 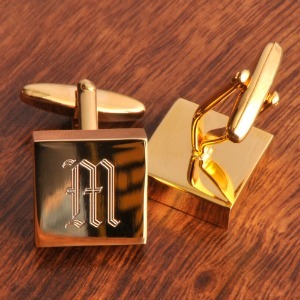 These engraved brass cufflinks would make the perfect personalized brass anniversary gift for men. Personalize with their initials and you know your husband will treasure these. 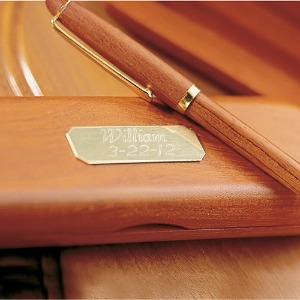 If your partner loves to write, how about this beautiful rosewood pen and engraved pencase to match? You can add your own special 21st anniversary message to the front of the box, as a reminder. When it comes to celebrating your anniversary, jewelry is normally a popular choice. The great thing about choosing brass jewely is that it would make a great gift for men and women. 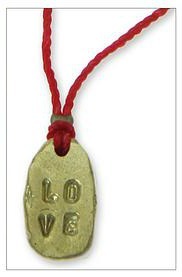 Take this lovely handcrafted brass love pendant available from Novica, a great gift for both of you. They have lots more gorgeous brass peices for you to choose from. Brass gifts always remind me of the sea with all the brass on the ships. We spent a few years in Portsmouth, England and visited the historic ships a number of times. A couple of our friends even got married on the Victory. If you ever get the chance it is well worth a visit. Any ship journey would easily fall into the brass gift category. If you are not close enough to the sea to visit then you can still find great brass goodies. Nautical brass gifts could be a compass, portholes, clocks, diving helmets and oil lamps. For those of you who enjoy a more relaxed way then how about an anniversary trip to a great British country pub with all their brass ornaments and beer pumps. Good food and beer would be a great way to spend a lunchtime. Or if music is more of your thing why not take a trip and listen to a great brass band in concert. With all this brass around don't forget the bottle of Brasso and some cloths - but not as a gift! The 21st Anniversary Gemstone is Iolite with strengths of joy and happiness and a gorgeous purple color. Here are lots of gorgeous pieces of jewelry that would be a perfect gift for your 21st Anniversary. Iolite is often thought of as the stone of the Vikings, who used the stone to work out the exact position of the sun and therefore find their way home or their next adventure! It is believed that Iolite takes you on the journey of enlightenment and also helps with money and debt problems too, which in today’s modern world we probably all need some of all of that. But more than what is believed the stone’s strengths are is also quite unique in that it can shine different colors depending on the way it is cut and also varies from one side of the stone to the other. However if the stone is cut correctly it should shine a violet or purple blue. If you like to add an Anniversary Vacation to your gift then you could look to where the stone is mined; India, Sri Lanka, Mozambique, Zimbabwe and Brazil.